Helen informed us that human language is not the only way that species communicate. Plants form intimate associations with fungi and bacteria, which allow them to thrive in stressful environments. Establishment and maintenance of the relationship depends on the passing and receiving of coded information between partners. She also told us that plants can only defend themselves against microbes that they can sense. This interspecies communication is not restricted to plants and microbes. The human intestine is home to diverse bacteria, allowing us to harvest nutrients that would otherwise be inaccessible. The human immunodeficiency virus chooses for its target only those of us that carry a specific receptor, decorated in a particular way. All these interactions dramatically affect human health and farm productivity. This is the story behind the story of our two papers published last month in Plos One and Discovery Medicine. We showed that single-celled bacteria communicate with each other using coded messages to coordinate attacks on their targets. Until now, the diversity of codes employed by these invading bacteria was thought to be extremely limited. We showed that one group of bacteria communicate by a novel, previously undescribed signal – and, as if to prove Helen Stafford correct- some plants have evolved a complementary cypher-breaking detection system that intercepts this bacterial code and then uses the information to trigger a robust immune response, preventing disease. 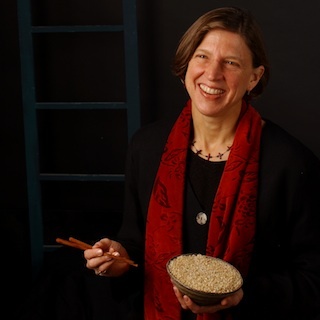 The author Carol Shields has said that “The scientific life is the most complex of all to write about. In the case of scientists, impulse becomes compulsion”. And so it was with me. A year after college, I moved to Sweden to study with Professor Nils Fries who had identified a compound in pine trees that could coax some fungi to establish a lasting, mutually beneficial relationship. But pine trees and fungi and are difficult to study because they grow slowly. For this reason, when I returned to the US, I shifted my research to bacterial-plant interactions and their impact on plant health. In 1905, British geneticist and plant breeder Rowland Biffen demonstrated that it as possible to generate wheat varieties with resistance to a devastating diseases by moving genes around. He cross-pollinated a resistant wheat variety with a susceptible wheat variety and showed that the resulting seed carried the resistance of the parent. Today, more than 100 years after Biffen’s discovery, plant breeders have introduced "resistance genes" into virtually every crop plant that we consume. But what are these genes? How do they function to detect the disease-causing microbe? For many years, the molecular basis of resistance remained elusive. These were central questions addressed by the laboratory of Brian Staskwicz, where I carried out my PhD work. He had recently identified a bacterial protein that triggered an immune response in infected plants. He later identified one of the first plant resistance genes. After graduating, I moved to the laboratory of plant breeder Steven Tanksley at Cornell who was pioneering gene mapping in plants using molecular methods. 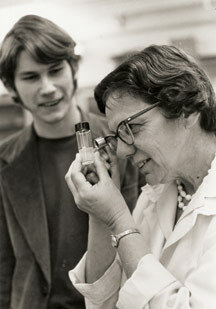 My focus was a genetic locus, called Xa21, described in 1977 by Drs. S. Devadath, Gurdev Khush and collaborators. 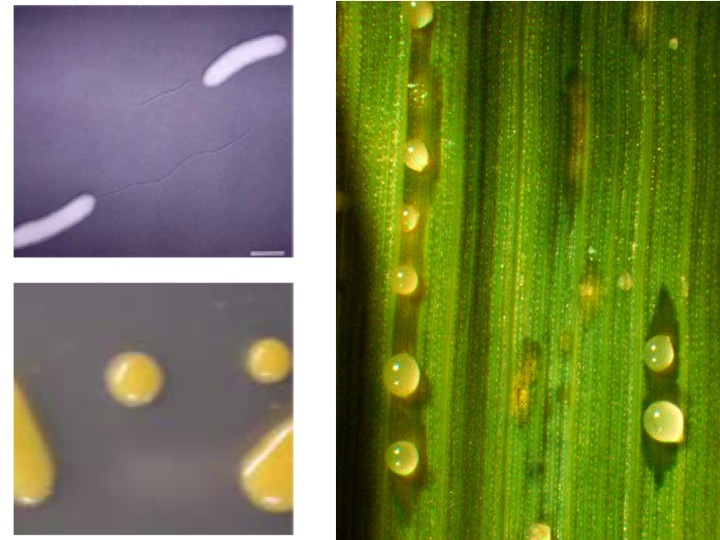 Rice plants carrying Xa21 have an unusual property: they are resistant to all known races of the bacterial pathogen Xanthomonas oryzae pv. 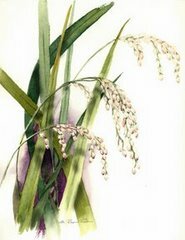 oryzae (Xoo), which normally caused a devastating disease of rice in Asia and Africa. 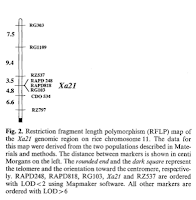 In 1992, I mapped this locus to a specific region in the rice genome. I hypothesized that it must consist of a cluster of tightly linked genes each recognizing a single race of the pathogen or a single gene that encoded a receptor recognizing a conserved microbial signature present in all races. When I moved to UC Davis I began a map-based cloning approach to isolate Xa21. In 1995, two talented postdoctoral fellows in my lab, Guoliang Wang and Wenyuan Song, successfully isolated Xa21 and showed that it encoded a single gene: a receptor kinase. The structure immediately suggested that the XA21 protein could detect a microbial molecule present outside the plant cell and that this perception would activate an immune response inside the cell. 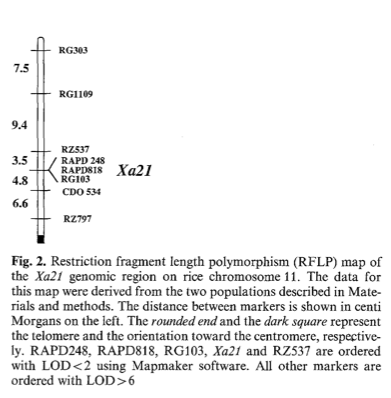 A few years after the discovery of the first plant resistance genes, the fly Toll and mouse Toll-like receptor (Tlr4) genes were isolated and shown to have striking structural similarities to XA21. Like XA21, TLR4 is membrane bound extracellular receptor that was predicted to bind a conserved microbial signature. 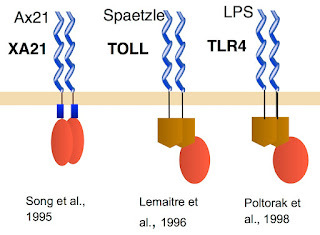 TLR4 also carry the Toll /IL-1 Receptor (TIR) domain found in fly TOLL, the tobacco N resistance gene and the flax L6 resistance gene. 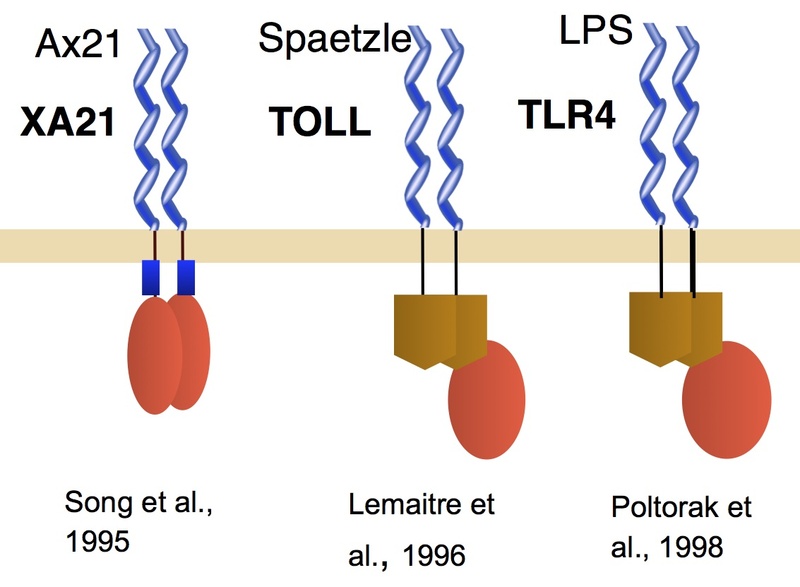 Thus, the discovery of a role for Toll and TLR4 in immunity provided a structural link between sensors utilized by plants and animals to detect infection. Professors Bruce Beutler and Jules Hoffman were awarded the 2011 Nobel Prize in Physiology or Medicine for their important work. The next challenge was to isolate the conserved microbial signature produced by Xoo that was recognized by XA21. To isolate this molecule, which we named Ax21 (Activator of Xa21-mediated immunity), we screened for bacterial mutants altered in their ability to produce active Ax21. In this way, we isolated and characterized eight genes required for Ax21 activity (rax genes). raxA, raxB and raxC encode components of a predicted type I secretion system. Ax21 requires this RaxABC system for activity and secretion. The RaxB protein carries two highly conserved domains characteristic of proteins in Gram-positive bacteria that cleave N-terminal peptides prior to secretion of small proteins. Another set of rax genes encoded proteins important for sulfation. 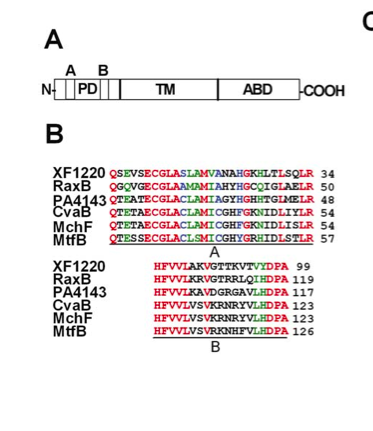 These data suggested that Ax21 was a small sulfated protein with an N-terminal leader peptide, which was cleaved by the RaxB transporter prior to secretion outside the bacterial cell. Much to our delight, that is exactly what we found. Ax21 is a small protein with a tyrosine sulfation site and a predicted N-terminal leader sequence. Ax21 is not secreted in the absence of the RaxABC type 1 system. XA21/Ax21 binding triggers XA21-mediated innate immunity. 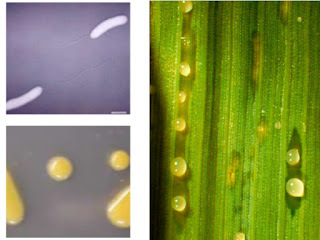 The Ax21 sequence is conserved in all Xanthomonas spp., in Xylella fastidiosa and the human pathogen Stenotrophomonas maltophilia. This conservation suggested that Ax21 serves a key biological function. In our latest paper, we demonstrated, using two different methods, that the predicted Ax21 leader is cleaved as predicted. We further showed that only mature Ax21, missing the leader, is found outside the cell. When we add the purified protein back to a mutant lacking the wild-type gene, we can restore all Ax21 functions. These experiments demonstrate that the Ax21 protein acts outside the cell. We then used a genetic approach to reveal that the likely bacterial receptor for Ax21, is a histidine kinase called RaxH. Finally, we show that the Ax21 mature protein has some pretty impressive capabilities: bacteria use it “talk” to each other. Over the last 20 years, researchers have shown that bacteria employ specific signals to communicate. These signaling molecules, called “bacterial Esperanto” by Professor Bonnie Bassler, an early pioneer in studies of bacterial communication, accumulate in the external environment as the cells grow. When the concentration reaches a certain threshold level, the bacteria mobilize together to carry out concerted, group actions. This process is called quorum sensing. Until now, it was thought that the two major groups of bacteria (Gram-positive and Gram-negative) use distinctly different types of communication codes. However, Ax21 doesn’t fall into either class. While the previously characterized signals in the bacterial coding repertoire were all relatively small molecules, Ax21 is a small protein, which makes it much larger. Perception of Ax21 by the RaxH receptor triggers a massive change in the bacterial genetic program, altering the expression of nearly 500 genes, or approximately 10% of the bacteria’s genome. These changes allow the bacteria to assemble into elaborate protective bunkers, called biofilms, which render the bacteria resistant to dessication and antibiotic treatment. 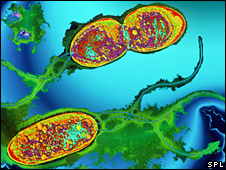 Thus, by virtue of communication and communal living, bacteria increase their chances of survival and proliferation. Ax21 perception also regulates the production of a virulent arsenal, including “effectors” that are shot directly into the host to disrupt its defenses and that initiate motility, allowing the bacteria to colonize new sites for infection. Most rice plants are virtually defenseless against this Ax21-mediated bacterial attack – except for those plants that carry the XA21 immune receptor. This early detection gives the plant time to mobilize its defenses and mount an early and potent immune response. The discovery that a small protein from a Gram-negative bacterium has a dual role in bacterial communication and in activation of the host innate immune response has not previously been demonstrated. We do not, however, believe this is an anomaly or that the biological importance of Ax21 is restricted to plant pathogens. We previously reported that Ax21 is also conserved in the nosocomial pathogen S. maltophilia and proposed a similar role for Ax21 in this species. Consistent with our hypothesis, a synthetic Ax21 protein has now been shown to regulate gene expression, motility, and biofilm formation in S. maltophilia, extending our findings to an animal pathogen. Exploration of other bacterial genomes reveals the presence of an abundance of small secreted proteins similar to Ax21, suggesting the intriguing possibility that other species of bacteria also use small proteins to communicate and coordinate infection. Control of Gram-negative bacterial infections in plants and animals remains a major challenge for the medical profession and for farmers, because conventional approaches are often not sufficient to eradicate these infections. One major reason for their persistence seems to be the capability of most bacteria to grow within biofilms that protect them from adverse environmental factors and antibiotics. The knowledge that bacteria use Ax21 to communicate can be used to develop reagents to immunize hosts against infection or antagonists to disrupt Ax21-mediated virulence activities and biofilm formation, a process thought to be involved in 65-80% of bacterial infections of plants and animals. Convincing the scientific community that a Gram-negative bacterium uses a small, N-terminal processed protein for bacterial communication has not been easy. We initially submitted the manuscript to Science in 2009. One year, two manuscript versions, seven reviews, 16 figures and 11 tables later, we were still revising. All but one of the six reviews were enthusiastic: they found the work “highly interesting”, the experimental work of “high quality”, carried out “to an exceptionally high standard” and the “evidence compelling”. The initial set of experiments the reviewers asked us to carry out were challenging but reasonable. We completed them over 7 months of intensive experimentation. Happily, the reviewer said we had “addressed all the fundamental issues” requested in the first round of reviews and that “the revisions were satisfactory”. Most of the additional suggestions were easily addressed. None of the reviewers challenged our central conclusion: that the Ax21 protein processed and secreted outside the cell where it serves as a quorum sensing factor. Indeed it is almost impossible to envision a different interpretation of these results. One of the new reviewers pointed out that extracellular Ax21 must traverse the outer membrane to bind to the candidate RaxH receptor, which was predicted to localize to the inner membrane. The reviewer therefore asked that we isolate the genes encoding the proteins that make up the protein complex that imports Ax21. Such experiments, however, would require months, if not years, of additional work. Although we agreed that the requested set of experiments were interesting (and were already underway), successful completion would clearly not alter the fundamental conclusions of the paper. In addition, although the editor was kindly willing to consider our response to reviews, the editor cautioned us that the next version of the paper would be sent out to a THIRD set of reviewers. (With my academic compulsion for accuracy, I initially wanted to include the second set of reviews, verbatim, as part of this post. Conversations with colleagues and the editor convinced me otherwise. They felt it would rupture an important agreement: that the conservations between editor, reviewers and author would remain confidential). Because of the work described in the paper had already been talked about in public forums and included in grant applications, and because publication was important for moving forward with our grant applications, job applications and other papers, we felt we could not spend another year in the review process. The very essence of the scientific process is to challenge paradigms and share the experimental details with other scientists who can then reproduce or refute the findings. Publication is key for this process. We needed to publish. After much discussion in the lab and several more discussions with the editor at Science, we decided to take advantage of the explosion of open access journals as an alternative route to publication. I asked the editors at PLoS One if they would consider an expedited review. After reading the 4 science reviews, they generously agreed. They sent the paper out for an eighth review, which also came in positive. Finally, the paper was accepted. It was a long road but we are very glad the work is now available to other scientists to test and tweak. We hope it will be widely read. As one distinguished colleague pointed out, ultimately it may not matter where the results are published; if it has legs, it will stand. I was surprised by the "agreement that the conservations between editor, reviewers and author would remain confidential," I feel that authors (and journals) should have the right to post reviews, and some journals have started doing so. I've been too wimpy to do it myself though. I am not so sure it matters if Science promises reviewers that the reviews will never be shared. I talked to a lawyer today who thinks that "fair use" rules likely allow you to post some of the reviews without any problem. I think naming reviewers without their permission would be awkward. But I think even not using fair use rules, posting anonymous reviews of your paper seems likely to be OK as far as I can tell. "using fair use rules, posting anonymous reviews of your paper seems likely to be OK"
Still, I would be glad to share the reviews with you and anyone else that is interested. Just send me an email request and a fax number. The more discussion about this work, the better as far as I a concerned. I agree that the reviews should be open to publication on a blog or similar. But I feel that right now the situation is ambiguous: reviewers are neither told explicitely that their reviews are confidential, nor that they are potentially public. Recently I was impressed by the insight in a review by an anonymous colleague, of a paper of which I was also a reviewer. I asked permission from the Editor to share the review with colleagues (I did not suggest a blog post), and he agreed immediately. I feel that this was helpful to a good scientific discussion, and should be generally possible. So it seems that it's very dependent on the interpretation of each reviewer at present. Maybe PLoS at least could spell out explicitely that reviews can be shared anonymously, after publication? BTW, thank you Pamela for sharing this story. And please post more on your blog! I would love to see journals that posted the whole reviewing process, based both on a personal and professional interest. Note that, while I work at PLoS, I can't imagine a situation in which my comments on even the most sciencey blogs would reflect official PLoS business. That being said: I think our reviewer guidelines leave a fair amount of openness. At PLoS Pathogens, we explicitly say that reviews are shared with all other reviewers, for example, and that if a manuscript gets transferred to another journal, the prior reviews are shared with that journal. The PLoS ONE guidelines go much farther. "Upon publication, PLoS ONE may choose to post the referees' reports as comments accompanying the online version of papers (although this hasn't been routine since mid 2008)." Lovely post. Couldn't agree more with the conclusion that important thing is to get the work 'out there' rather than worrying about status of journal. Consensus among a large N reviewers might be a good way to pick uncontentious studies, but it is NOT a useful method for identifying groundbreaking studies. Which I thought was what Science was trying to do. @Jonathan: I don't think that anyone is suggesting posting reviews "willy nilly", but I would support clear conditions which inform the reviewer in advance that her/his reviews can be made public. Might also have a sobering influence on bad reviewers, who knows? @Karen: thanks for the links, I didn't know about these provisions for PLoS One. A little updating to account for blogs, et voilà ! like others, I am a bit puzzled by the use of "confidentiality" as an issue preventing the publication of peer reviews by the author of the peer-reviewed manuscript. Confidentiality, I'd think, is about avoiding certain consequences that the publication of a text or claim would have on the author or source of that claim or text. But if the identity of the peer reviewer is and remains unknown to both the author of the reviewed manuscript and to the readers s/he may share those reviews with, what's the confidentiality problem? I'd have assumed that in peer contexts "confidentiality" referred to the identity of the referee, not the content of his/her report. I don't want to be a pain in the neck, but what happened to my second attempt of commenting? It used to be online for a few hours and now it has disappeared again ? This is clearly an interesting research topic and an impressive piece of work. I am not a plant or bacteria person, but I am interested in PAMPs and bioinformatics and thus read (most of) the papers linked here - and some more papers linked therein. Nevertheless, I was quite disappointed that I was not able to actually find out what exactly constitutes the ax21 entity. This is not because I hit a paywall, most of the papers where in OA journals or those that I subscribe to. At several places, the ax21 entity (which actually binds to the XA21 receptor) is referred to as 'a secreted sulfated peptide', but I was not able to find the sequence in the manuscript or the figures. What I did find is a protein called ax21 (http://www.uniprot.org/uniprot/G0CLY5) which I suspect is the precursor of the active entity. The Ax21 protein has a leader-sequence which is mentioned in the papers, and an artificial peptide derived from the N-terminus of the mature protein seems to phenocopy the Xa21 activation. However, I don't see any mentioning what the physiological XA21 activator is supposed to be. I wonder why this question has not been adddressed and has not been asked for by the reviewers. Or is it mentioned somewhere and I have missed it? Suicyte - I note - I have some of the text from at least one of your longer comments - should I post? This will probably be my 2nd version, which has miraculously disappeared after being visible for a few hours. I can also re-post it (after the first fiasko, I have made a backup copy of the 2nd version). Kay, thanks for your interesting observations and questions. Yes, we also observed that Ax21 models as a porin, which is quite interesting because it may be that Ax21 can directly insert into the cell without assistance of additional import proteins. However, structural predictions are often not accurate. Furthermore Ax21 is much larger that typical porins, so if it is a porin, it would be quite unusual (although there is at least one example of a secreted porin (http://www.ncbi.nlm.nih.gov/pmc/articles/PMC523065/ ). We are now carrying out detailed genetic/structural studies to address these questions. A couple years ago we published the DNA sequence of Ax21, which you may not have been able to access if it is behind a paywall (see Lee et al., Science 2009; http://www.ncbi.nlm.nih.gov/gene/6304108; protein sequence pasted below). It is a small protein (PXO_3968) with a predicted N terminal leader. In this new open access Plos one paper, we show the Ax21 protein sequence that we derived from LC-MS/MS data (Figure S2). In 2009, we showed that a 17 aa sulfated peptide derived from the protein is sufficient to activate XA21-mediated immunity. In this paper we show that this small peptide is not sufficient to induce QS. We also showed that the RaxABC type 1 system is required for secretion and for Ax21 activity (Lee et al., 2009; Goes da silva, 2004). In the first version of the paper, the reviewers asked for additional experiments to prove that Ax21 acts extracellularly. In the second version, we provide several additional lines of evidence to address this question. We showed that show that the mature, processed Ax21 (lacking the N-terminal leader) is present outside the cell. We show that bacterial mutants lacking Ax21 (which no longer carry out QS) can be complemented with exogenous addition of mature recombinant Ax21 lacking the N-terminal leader. This work convinced the reviewers that Ax21 acts extracellularly. It is difficult to envision a different interpretation of these results and the reviewers did not question this. Instead one reviewer asked, how does Ax21 get back into the cell to bind the RaxH receptor? This is what we are working on now. By the way, XA21 is a receptor kinase. Please see Science 1995. The signal peptide is MLALGLLAALPFAASA. thanks for the response! What you say is very interesting, I had no idea that porins could be secreted. That of course changes everything - I had naively assumed that a porin would be stuck within the outer membrane, which would make for a poor QS factor. I am well aware of the pitfalls of structural prediction (I am in the business myself) but with Xa21 I am quite sure that it is a beta barrel. It would be interesting to have a look at the side chains sticking out of the barrel - in a typical OM protein you would expect mostly hydrophobics, while for a secreted factor you would expect residues that feel comfortable in water. Why do you think that AX21 is too big for a porin? Have a look at the stucture pdb:3NB3, chain A (OmpA), which is a perfect structual template for AX21. The barrel domain has the same length as Ax21 (sans leader). I acknowledge that this might be hard to reconcile with your experiments, but I am optimistic that in the end things will make perfect sense. Good luck with your experiments ! 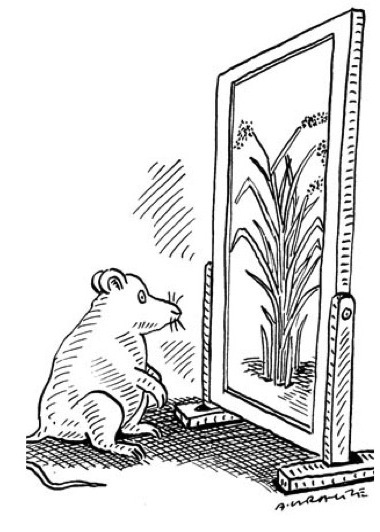 As a junior faculty member, dealing with the publication process, I really liked reading: "ultimately it may not matter where the results are published; if it has legs, it will stand." It is my understanding that Gram negative outer membrane proteins can be 'secreted' in outer membrane vesicles that bleb off from the cells under certain stress conditions. Beta-barrel porins may be the main protein components of these vesicles, as has been seen with OprF in Pseudomonas aeruginosa. Kay, sorry I mistyped. Ax21 is smaller than a typical porin (Not larger). For example, OmpA-like porins, are 30~35kda and the FhuA porin is 78.9 kDa. The mature Ax21 is around 20kDa. We agree it would be useful to look at the side chains sticking out of the barrel. In our I-TASSER results, Ax21 has 8 beta-barrels (OmpA-like porins also have 8). We can look more closely at the amino acid sequence. Once we get the structure, we will know more. Pamela, some porins (OmpA, FhuA) are larger because they have additional (folded) periplasmic domains. The size of the membrane-spanning beta barrel is about the same, and Ax21 clearly belongs to the OmpA-fold. The big question for me is whether the OmpA fold always means that the protein is embedded in the outer membrane (which should go along with a hydrophobic covering at the outside) or if some of them can exist outside of membranes. Your experiments suggest the latter, which is very interesing. It might also offer an explanation how a secreted 20KDa protein can have access to the inner membrane. Oops, I haven't seen the additional replys further down in this thread. Sorry for the duplication. Stephen G.J. Smith1,2, Vivienne Mahon1, Matthew A. Lambert1 & Robert P. Fagan Please see figure 2). Although the N-terminal domain of OmpA shows a similar structure with the predicted structure of Ax21, I doubt that the function of OmpA is similar to that of Ax21. After crystallization, we will know the details. Brook.. Yes. it is true. Gram negative outer membrane proteins can be 'secreted' in outer membrane vesicles (OMV). However, there is an example that the secretion of porin is not related with OMV. In the case of Oms28 porin, its secretion is not associated with outer membrane blebs..
Now we are doing some experiments for the structure of Ax21 and its detail analysis. I hope we can solve a big puzzle in the near future.. I really enjoyed this post and the final comment that "ultimately it may not matter where the results are published; if it has legs, it will stand." is precisely the topic I recently had a heated discussion over with another postdoc in the lab. She maintained that impact factor was critically important and when I pointed out that POne has a great impact factor she told me that people don't think POne is a good journal because of its high acceptance rate. My argument was that if impact factor is a true measure of how much that body of work is contributing to the advancement of science then POne articles must be relevant and important because they are getting read and cited.